BECOME MORE ENERGETIC USING HYPNOSIS!!! Hypnosis is an all-natural way to increase energy. All too often people rely on dangerous stimulants to boost their energy levels. These drugs include caffeine, sugar, and even diet pills and prescription drugs. This false and short-lived energy is nothing like the energy from within that can be obtained through hypnosis. 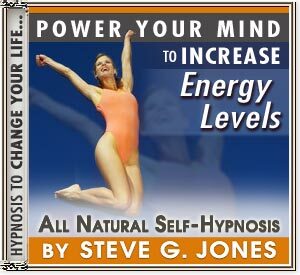 Dr. Steve G. Jones M.Ed., a clinical hypnotherapist has created a self-hypnosis program called, “Increase Energy.” The script found within this CD program will address the mental issues that often zap you of physical energy. It is mind over matter once again when it comes to being the best you can physically be.